Typically I do not leave feedback message! But we have used Lotus lighting in a number of our projects. With the Regressed model the lighting and fixture quality mimics lamps and fixtures that sell at a much higher price point. Further, the thickness allows placement virtually anywhere, especially if you are using methods to increase STC ratings (hat channel etc.) as it creates enough space for the Lotus fixture to fit under joists or rafters. Highly suggested! I have a 1950’s era dark kitchen that was desperately in need of additional lighting. The attic access is very limited and having to go up there has discouraged me from installing traditional can lights in the ceiling. After seeing Lotus Lights used on “This Old House” TV show I determined this was exactly what I need. I ordered 6 of the Lotus 6? round lights. While waiting for that delivery I used a stud finder and pair of dividers set to 6.375? to lay out the six lights evenly on the ceiling. The day the lights arrived I cut the six holes in the drywall ceiling, connected the lights together using Romex, popped them into position and connected the last lamp to an existing fixture electric box. Looks like a modern kitchen, lighting is even and perfectly covers the entire room. I referenced a couple websites for the best placement. I completed the entire installation without ever having to go in the attic and it’s ALL TO NEC CODE. The Lotus LED Lights I purchased worked awesome! 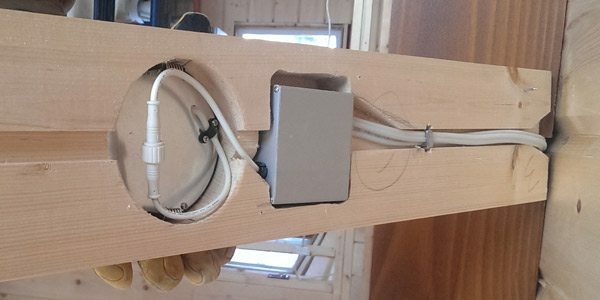 The sleek design made it possible to have the pot lights on the underside of a timber frame second floor system. Great product, excellent customer service. The slim design was easy to install and the quality of lighting is excellent. Purchased approximately 20 of the 4″ flat recessed LED lights from Lotus two years ago. They were part of my complete condo renovation. The service from Lotus was exceptional, products arrived on time and as described. The electrical inspector had no issues approving them and they are still working great two years later. Overall I’m very happy with the product. I connected all the lighting to a sleek Lutron Grafik Eye, so they are always being used at different dim levels. Your lights worked out fantastically! I used them as both accent and principal lights in the condo and they have a nice clean look, light up perfectly and work flawlessly. I am very happy that I decided to use your lights and I wanted to thank you for a great product. You led lights are some of the best I have seen. I have tried many led light over the years, but none was as sharp looking and dimmed as good as yours. I am delighted with the lights as well as they are a higher quality item than similar competitors products I have used in the past. I want to say how much I like and appreciate the lights that we have from Lotus Lights. I bought four of these to install in a renovated attic loft not knowing exactly how they would perform, basing my decision on the thickness and a few short reviews. After installing these and livening them up all I can say is wow! These LED units are impressive, throwing out a warm and inviting light that compliments the room. If I knew how well they would work, that’s all I would have installed throughout the 1400sq/ft attic loft. If I could up load pictures, I would gladly show these off. 1. There aren’t detailed installation instructions included with the units. You do need to know a little about lighting installations. Call an electrician and have it done right the first time. 2. Plan out your lighting scheme. I found that on an 8′ ceiling, about 36″ spacing is perfect. 3. Don’t throw away the cardboard ring which only looks like packaging; it’s your template for a perfect fit…dumpster diving is not fun. 2. Make sure you use Loomex/Box Connectors or similar when connecting multiple lights, 2 per unit, last one on the loop only needs one. 3. Where the site says to use a dimmer that is LED rated…spend a few extra bucks else they will not work as well and cut out about half way down the slider. No fault of the lights, its the dimmers fault purchased by the user. 4. If you are planning to install in an area with blown in insulation above, use a protection bag. If not, the moment you pull one out to show it off to your buddy, you’re going to need a vacuum. Not fun again. I would highly recommend these to anyone doing reno’s or new installations where you want a low power consumption but high quality light with exceptional light dispersion that doesn’t hurt the eyes like some of the LED products or CFL bulbs I’ve come across. I ordered these light due to the restrictions of a normal can light in a drop ceiling. We wanted the ceiling to be at a specific height and lights spaced as needed. These lights did not disappoint. The color and brightness is great. The ability to use a dimmer added to the attraction. To top it off, we needed these lights within 3 days, the normal delivery went beyond this. I included a note with my order explaining my scheduling issue. George made sure these lights were at my door when we needed them.I am extremely happy with the lights and the company! I had to do a retro-fit in my condo but found insulation in the ceiling. After a long search online I settled upon this product which seemed like the perfect solution : slim, IC Rated, low power and dimmable. Shipping was quick and the product did not disappoint, it was easy to install and surprisingly bright. I will be purchasing more of these guys in the future for sure! I have recently installed 12 of the 6 inch ultrathin led lights, they are absolutely beautiful and bright. With 12 of these lights in a 20 feet by 20 feet room it looks like day light at any given time. It is not harsh on your eyes although they are dimmable to 20% of their brightness which I do when watching movies which is a totally different experience. The product was good all the lights worked and the shipping was fast from Canada to Chicago it took 4-5 days. Lotus LED really sets the bar high. I was really impressed with the service, and then also very impressed with the product, not often that things work flawlessly in DIY projects, but with Lotus LED it left me with a sense of satisfaction. Thanks! The light was easy to install and gave off a surprising amount of light. Highly recommended. Great quality, very durable and bright. Good replacement for halogen lighting. I have installed both colours and sizes, both excellent products and great service! We used 41 of these 6″ warm white lights for the entire basement renovation. 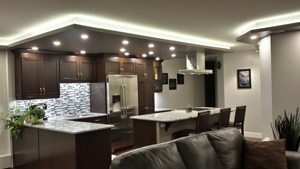 Since our basement is only 7’6″ high we were looking for a lighting solution that does not hang below the ceiling (or even flush-mount) so these lights fitted the bill nicely. 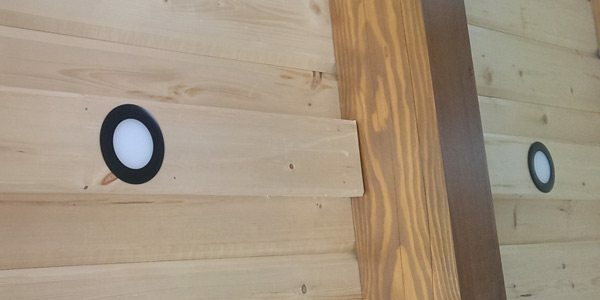 Unlike traditional pot lights that can be installed only where the joists configuration allows, these half-inch thin LEDs can be installed directly under the joists if needed, thus allowing desirable layout. Depending on the room, we spaced them 4′ to 5′ from each other in a rectangular pattern (slightly less, 2′ to 3′ from the walls) which, considering 120 degrees beam width angle, provides sufficient light coverage at the eye level of a standing average person, and abundant light level at the desk/table surface where the beams overlap. Almost all the rooms in our basement have the lights split between two switches to have more or less light as needed; some areas have also dimmers for even more granular control over the brightness. Very happy with the results. Excellent service and fast delivery was a bonus. I purchased 9 of these lights for a kitchen renovation and I’m extremely pleased with the result. Excellent warm light, very bright if needed and dimmable when not. Very easy to install. I want to congratulate you on your service, order follow-up, quality of product and packaging. When I told my wife of my experience dealing with you, her comment was “.. are you sure you are dealing with a Canadian company?”… Thank you very much and I will have no trouble recommending you in the future. Again thank you for your service. We would highly appreciate it if you could take a moment and leave us your feedback on the products and service you received from us.